Highly versatile and easy to use, PowerNet was designed for use on most electrical design and analysis applications. Use it for commercial building services, industrial plants, distribution systems, power factor correction. Highly versatile and easy to use, PowerNet was designed for use on most electrical design and analysis applications. Use it for commercial building services, industrial plants, distribution systems, power factor correction. Any project where you need to know voltage, current, kw, kva or kvar on any and all parts of the circuit. 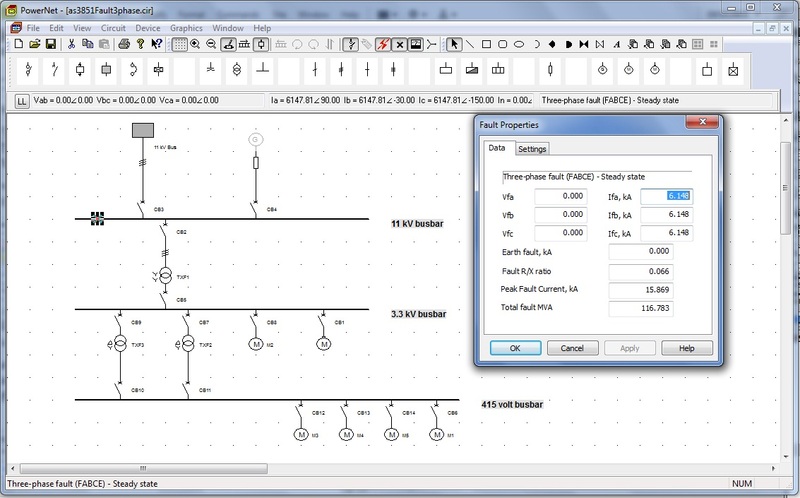 Save time on load flow calculations and line to neutral , line to line and 3-phase faults. A list of some of the capabilities of PowerNet * Calculate DC, single phase or three phase circuits. * Complete device information includes node voltages, voltage drops, current, kW, kVA and kVAr flow. * Evaluate the effects of disconnected devices and branches on the rest of the circuit. * Calculate three-phase, line to ground, line to line and double line to ground fault. Include motor contribution to fault. Show earth current, fault R/X ratio, RMS and peak fault current. * Single click display of device rating and electrical data. Graphical display of voltage and current vectors. * Create or modify set of device symbols. * Highlight devices with overcurrent, kVA/kW overload, over/undervoltage. * Print or plot to any Windows compatible printer or plotter. * Cut, copy and paste devices and circuit sections to the Windows clipboard. * Use graphics to annotate and add legends, title blocks, logos to the single line diagram.